Essex opener Nick Browne's scored a career-best 143 against Surrey. 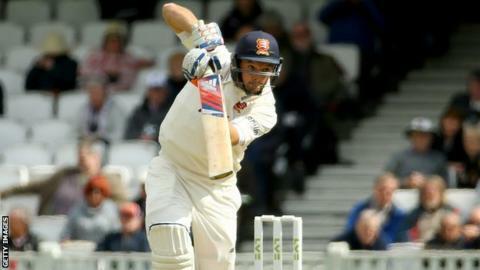 Essex opener Nick Browne hit his highest first-class score to put his side on top against Surrey on day two. In only his 14th first-class match, the 24-year-old made a polished 143 as the visitors replied to Surrey's 340 by reaching the close on 266-2. Browne's innings capped an excellent day for his team after a dramatic Surrey batting collapse in the morning. The home side were 340-6 but then lost their last four wickets, three to Graham Napier, without scoring a run. Napier ended with 3-63 to bring a rapid end to an innings which looked set to pass 400 while Steven Davies (81) and Gary Wilson (46) were at the crease. But after Surrey's tail collapsed it was a tale of toil for their bowling attack, hampered by a side-strain suffered by fast bowler Jade Dernbach, as Browne added 155 with Jaik Mickleburgh (61) and 109 with teenager Daniel Lawrence who ended the day on 48 not out. "We were hoping to push on this morning with our batting but unfortunately that didn't happen so it was down to the bowlers. "We're used to hard work on pitches that aren't offering that much but this one is offering a little bit so we have just got to commit to it and hit the pitch hard. "Jade Dernbach has what looks a side-strain so he's going to have a scan tomorrow when we'll find out what the damage is. "He's a fighter and he tried to get through but it just got worse so it was wise to take him off and get him seen to." "Not a bad day. I pride myself on converting fifties to hundreds and trying to score big hundreds. It's something I really want to do and keep doing as well. "I think it's important when you play against good bowlers and sometimes on tricky wickets that you've got to know what your weaknesses and your strengths are. "It's taken a while to learn but I know that now and hopefully I can continue to do that and replicate this more often than not."